What is the best way to calculate the due date of your delivery? Finally, you have tested positive in the pregnancy test. And now, your next concern will be to know the date of arrival of your baby. Getting pregnant is the beginning of the journey to parenthood. The stages of pregnancy are little steps you take towards parenthood. And when your little bundle of joy arrives, you are finally “parents”. But on which day will your bundle of joy arrive? This is the question that would keep you guessing and that would be frequently asked by your friends and family. Of course, your gynecologist will calculate and give you the expected date of delivery. But is it the exact date your baby is going to arrive? Maybe or maybe not. We all know that the duration of pregnancy is 38 weeks. However, Estimated Due Date (EDD) is usually calculated based on your Last Menstrual Period (LMP). Your doctor would add 40 weeks (280 days) to your first day of LMP and give you an EDD. But why 40 weeks, if the pregnancy duration is only 38 weeks? Well, 38 weeks is the time required from conception to delivery and the 2 extra weeks is to account for your time to ovulate. But haven’t we all heard about babies which arrived 2 weeks later or earlier than the due date? How do the doctors explain this? Well, it sounds confusing, right? 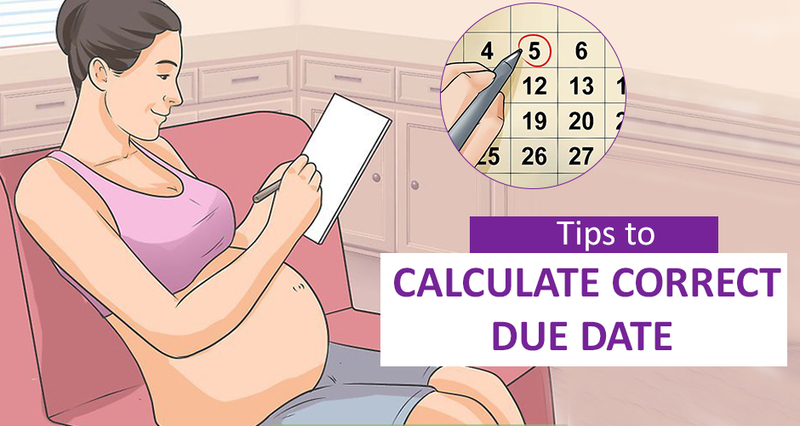 Let us understand the different methods of due date calculation in detail. Naegele’s rule is the most popular method of due date calculation on which most pregnancy calendars and online due date calculators are based on. #1. Your menstrual cycle is regular and is 28 days long. #2. Your ovulation always occurs on the 14th day of your cycle. This rule has a general assumption that all women have a 28-day cycle and they all ovulate on the 14th day of their cycle. This is not true for all women as many women have irregular periods and even women who have regular periods may not have a 28-day cycle. Also, recent data analysis has shown that only around 4% of the babies arrive on their due date. Also, it has been observed that most women are likely to deliver the babies at least 2-4 days after the due date. Since it adds extra 2 weeks from the first day of last LMP into consideration, by the time you miss a period, you are already considered 4 weeks pregnant! Biologically, this is not possible as you can conceive only after ovulation, which can be between 12-16 day of the menstrual cycle. So, the Naegele’s rule may not be the most accurate one but it still gives a fairly close time of delivery. A study was conducted in 1990, in which it was observed that an uncomplicated pregnancy lasted for an average of 288 days past LMP for first-time mothers. For not first-time moms, the pregnancy lasted for an average of 283 days. However, it is important to note that the study conducted was mainly of people of Caucasian race. Try this due date calculator using the Mittendorf-Williams rule. The date of conception is the day when the egg and sperm meet. Women who track their ovulation can make out the date of conception. Since the human gestation period is 38 weeks, you just have to add 38 weeks to your date of conception to get the EDD. This method is particularly useful for women who have irregular periods or cycles which are longer or shorter than 28 days. Gestational Age (GA) refers to how long the baby is gestating in the uterus or how long the pregnancy has progressed. Whenever you go for an ultrasound, your reports will always mention the gestational age in a number of weeks. This calculation is based on the growth of the baby and how it measures. LMP is not used to calculate gestational age. Your radiologist or the gynecologist may be able to predict the due date through gestational age. However, the due dates calculated from LMP and from GA do not usually match perfectly. In case, the doctor finds a significant difference between the due date determined from GA and the due date calculated from LMP, she might probe further and determine the due date. A “due month” is a time frame in which you can expect to deliver your baby. To calculate this, just subtract 2 weeks from the EDD given by your doctor and add 2 weeks to the EDD again. These 4 weeks together make up the “due month”. It is estimated that only 4% of the babies arrive on their due date, and 80% of the babies either arrive 2 weeks before EDD or 2 weeks after EDD. So, knowing the “due month” will help you be prepared for the arrival. How do you know in which trimester of pregnancy you are in? Pregnancy is divided into 3 trimesters each. The first trimester is from the date of conception to the end of the 12th week of your pregnancy. Most women experience nausea, fatigue and bloating in the first trimester. The second trimester is from the start of the 13th week of pregnancy to the end of 26th week of pregnancy. This is the most comfortable period in your pregnancy as nausea and fatigue ease out and also the discomfort is less. The third trimester is from the start of the 27th week of your pregnancy until the delivery. This period causes maximum discomfort as the baby is slowing coming to its full term in the uterus. Dear Mothers, the due date is always “estimated” and not accurately calculated to a final value.Pregnancy is a natural process to ensure the continuation of species. Sometimes, we have to trust nature and allow our baby to arrive when it is ready. Though your gynecologist may give you an EDD, be prepared for the arrival much before that or later than that. Your baby is not going to be harmed or born with defects if it is either a few days late or early. However, be prepared for the arrival in the “due month”. Also Read: I really wish I could be pregnant forever! Want to share your experience as a mom with other moms through words or images? Become a part of the Moms United community. Click here and we will get in touch with you.